Characteristics, Development of French Medieval Mural Paintings. of the Romanesque era in France. For a general guide to Church painting, see: Christian Art (150-2000). St. Pierre Church, Moutiers, France. serve as a form of devotion. When it comes to Romanesque painting in France, apart from Touraine and the neighbouring provinces, Maine, Anjou, Poitou, Berry and Orleans, which comprise a particularly favoured region, we must mention three other important zones: Burgundy, Auvergne and Roussillon. We shall study the latter in connection with the Romanesque art of Catalonia, since Roussillon was mostly a Catalonian dependency until the Treaty of the Pyrenees in 1659. As has been suggested by the Romanesque art scholar Duprat, medieval painting in France can be conveniently divided into four groups, which differ essentially in manner: (1) the fresco paintings of the west, with subdued colour on a light background; (2) the bright paintings on blue background found chiefly in Bugundy and in the south-east; (3) the paintings of Auvergne, with their dark background; and (4) the Catalan paintings of the Eastern Pyrenees. Of course this division is valid only in its broad lines, and we can find paintings with light backgrounds in Auvergne and Burgundy. In any case, many works cannot be attached to any particular school or group. The chapel of the priory of Saint-Gilles at Montoire was entirely covered with paintings of which the only ones that remain today are those of the original apse, painted in fresco with additions in distemper and encaustic, and those of the transept apses and two apsidioles. This chapel, which is very beautiful despite the many mutilations it has undergone through the centuries, once had Ronsard for its abbot. It is periodically endangered by the sudden rising of the River Loire. The damp has completely unstuck the ground of the paintings at the base of the walls, particularly as the river's successive floodings have buried these more than a yard deep. The Biblical art of Saint-Gilles presents an exceptional and very striking spectacle. Christ figures in the three apses and on the vault of the triumphal arch; in the centre apse we see him teaching, in the south apse handing the keys to St. Peter, in the west apse sending the Holy Spirit to his apostles. Carolingian influence is obvious, especially in the paintings of the triumphal arch, where Christ, in a medallion, is shown crowning the Virtues which have defeated the Vices. Near Montoire, the church of Saint-Jacques-des-Guerets - at Troo is also at the mercy of the River Loire's water levels. On the north wall of the choir, on two registers, are the Massacre of the Innocents and the Nativity. On the left of the axial window, a touching Crucifixion with the Virgin and St. John at the foot of the cross, which is black and green with a yellow border. In the embrasure of the window, the Finger of God, St. George and St. Augustine. On the south wall we see Pride overthrown and Anger piercing itself with a sword. Further on, Paradise, with a great figure of St. Peter, then the martyrdom of St. James, the legend of St. Nicholas and finally the Raising of Lazarus. This group of paintings, which reveal an expressionism that anticipates Gothic art, was certainly not executed before the second half of the twelfth century. Note the new colour pigments used: an unusual mauve, and combinations of lemon-yellow or coppery yellow with almond-green. The choir of the church of Areines, dedicated to Our Lady of Carmel, is decorated with paintings which combine delicacy and grandeur, and where the figures, standing out against a light background, are surrounded by a thick, but clear and precise outline. The detail we show, a saint's head where the eyes stand out white (being in wax, so as to shine more brightly than the rest of the subject, they have come apart from the wall) is a striking example of the mastery attained by the medieval artists of this region in the twelfth century. In 987, the date of the accession of the Capetians, Thibault, Count of Tours, founded the priory of Tavant. However, it is not the monastic church (destroyed by fire in 1070) which is famous for its frescoes, but the parish church of Saint-Nicolas. In the crypt, a low dark chamber whose vault, scarcely higher than head-level, is supported by two rows of four pillars, the paintings decorate the arches between the pillars. They form one of the finest ensembles of Romanesque painting in France, but they are in danger of disappearing in a few years' time unless radical measures are taken to preserve them. The central theme must be interpreted as a struggle between good and evil, in which the scenes, often without direct relation to one another, are taken either from the Old or the New Testament or from other sources. On a thinnish plaster, standing out against a light background, the figures, single or in groups, painted in simple but strong colours (red and yellow ochres, red-brown and earth-green) have a spellbinding expressive power. Amongst the best-preserved scenes, Christ in the underworld delivering Adam and Eve, David slaying the lion, and the figure of a man clapping his hands, usually identified as Saul , are sufficient proof of the genius of the artist, making masterly use of the narrow space at his disposal in the crypt. The opinion expressed by Merimee in 1845, when he was Intendant of Fine Arts, still holds good: the frescoes of Saint-Savin constitute the most important and magnificent ensemble of religious paintings of the Romanesque style, in France. The abbey church of Saint-Savin, which is exceptionally large (the nave is 140 feet long and 40-50 feet high) includes four great groups of paintings, those of the porch, the choir, the nave and the crypt. Several painters worked at Saint-Savin but, as though one master-painter had directed their collective work, the various sections have been executed with such similarity of feeling, without the intrusion of personal method, that one can almost speak of a "Saint-Savin style". In the vault of the nave, the first three bays are cut by double arches, and the remainder presents an unbroken surface. The cycle of painting comprises, in succession: the Creation, the Fall, Cain and Abel, the stories of Noah, Joseph and Moses; in all, thirty-six scenes, of which the order is interrupted here and there, probably owing to the conditions of building, the artists having to perform their task before that of the masons was completed. The total effect of the vault is most striking. Far from confining themselves to the classical type of background with horizontal bands of colour, as at Brinay or Ebreuil, the artists of Saint-Savin made bold to break with custom by using ridged or undulating bands, interrupted, when they wanted to emphasize a particular figure, by zones of darker colour. The general composition, however, is amazingly harmonious, with its balance of light and dark sections, of broad and narrow strokes, and with the quality and nobility of the disegno. In the entrance chamber to the nave (a porch serving as base to the tower) the mural decoration, which today is rapidly fading, is of remarkable beauty. A series of visions - the Archangel conquering the Beast, the plague of locusts, the white horses with crowned human heads - is surmounted, above the archway into the nave, by a Christ in Glory in the Heavenly Jerusalem. The vaulted chamber of the gallery is as high as the nave, and the paintings there, now very faint, must have been among the most beautiful of Saint-Savin. Unfortunately the details that remain only allow us to guess at their exceptional quality. The paintings in the crypt represent episodes in the lives of St. Savin and St. Cyprian. The difference in technique between these frescoes, and those in the porch, the gallery and the nave, is considerable. Here, instead of being set out with divisions between the various subjects, the themes are treated almost continuously. The colours are much darker, the figures clumsier, the subjects repeated several times, almost monotonously. Many experts have concluded that this is the work of a different artist. And yet, after searching examination, we are tempted to agree with Deschamps, who considers Saint-Savin as the work of a team directed by a master-painter. Discovered in 1849 by the parish priest, the frescoes of the church of Saint-Martin-de-Vie, in the Bourbonnais, were classified as a result of an appeal by George Sand. This, however, did not protect them from further vicissitudes. The architectural plan of the building is a strange one. A wall pierced by an arcade separates the choir from the nave. This wall, the choir and its apse are covered with paintings in a very good state of preservation. The choice of themes has obviously been governed by the same moral preoccupations as at Saint-Savin: the cycles of the Passion, of Genesis, together with a large painting of the life of St. Martin, patron of the church, and an edifying subject, the parable of Dives and Lazarus. If the scenes depicted are analogous, the workmanship is very different. Here we are confronted with a more popular type of art, picturesque and anecdotal. Feeling for plastic form is combined with a wealth of violent colour and an impulse to caricature; the figures are crude and often ugly, reminding one that the basic elements of Carolingian or Ottonian art are here strongly tinged with the gaulois spirit. In the apse, the crucifixion of St. Peter stands next to Christ in front of Herod. In the choir, on the north wall, on the lower register: the parable of Dives and Lazarus; on the middle register, the washing of the feet, the Kiss of Judas and the Arrest of Jesus; St. Martin occupies the upper register. On the south wall, the continuation of the story of Dives; the paintings on its middle register have disappeared; on the upper register the Entry into Jerusalem and the Purification of Isaiah's lips with the burning coal. At Saint-Aignan-sur-Cher, the crypt, built at the same time as the collegiate church, is a very large one; it consists of a central chapel surrounded by an ambulatory opening on to three chapels. Of the frescoes of the axial chapel, dating from the early twelfth century, nothing is left but the medallion with the Lamb and two Evangelists' symbols. At the end of the same century it was redecorated, and the scene which remains from this period, the Raising of Lazarus, has an impressive grandeur. The severity of the drawing of Christ's face, the tawny colour of his hair and beard are as striking as the strangeness of his garments. Above Lazarus we see the figures of his astonished kindred. The decoration of the chapel of Saint-Gilles, consecrated to the story of that saint, is wholly different in workmanship; the drawing is cruder, the colours darker, though fine and glowing. On the far left St. Giles is seen giving his garment to a sick man who is restored to health, then he saves a man bitten by a great serpent, and finally, through prayer, calms a storm. At Poitiers, we must note the frescoes in the crypt of Notre-Dame-la-Grande where two paintings - representing saints, confessors holding a book and martyrs with crowns - are obviously inspired by Carolingian art and may date from the eleventh century. Also at Poitiers, the basilica of Saint-Hilaire contains some striking remnants of paintings of the late eleventh or early twelfth centuries. Amongst these we may note the figure of a saint holding a book and the portraits of the bishops of Poitiers. Note: Along with the Ile de France, Poitiers was an important centre of stained glass art, and associated craftsmen. See also stained glass materials and methods. 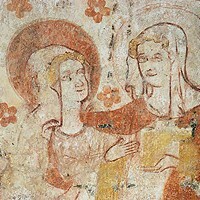 The paintings in the church of Saint-Aignan-de-Brinay, discovered in 1913, date probably from the beginning of the twelfth century. As at Vic, the sanctuary has its choir separated from the nave by a wall pierced by a semi-circular arch. The frescoes, arranged in two registers, illustrate the childhood of Christ and a few episodes of his public life: the Annunciation, the Visitation, the angel appearing to the shepherds, the journey of the Magi, the Massacre of the Innocents, the Presentation in the Temple, Joseph's dream and the Flight into Egypt; then the Temptation of Christ and the Marriage at Cana. This cycle of paintings, in which the groups stand out against a background of orange-yellow, white and blue-green bands, is remarkable for its harmony and serenity. The figures, with narrow faces and elongated legs, recall on the one hand those of Saint-Savin and Tavant with their Carolingian characteristics, but also Saint George of Oberzell through a certain Ottonian influence. Owing to lack of space we must pass rapidly over a whole group of churches in western France, in which the paintings are unfortunately in very bad condition and even in the process of rapidly disappearing - those, for instance, in the chapel of Saint-Jean-du-Liget, a dependency of the Chartreuse founded in 1178 by Henry II of England, in token of expiation for the murder of Thomas Becket, and those (discovered in 1948) in the church of Vieux-Pouzauges, in Vendee, which are already becoming overgrown with a coat of green moss due to the damp Atlantic winds. In Mayenne, near Laval, in the church of Pritz, frescoes were discovered, underneath a coat of whitewash, which must have covered the entire apse. On the intrados to the triumphal arch is a fine calendar which may be of rather a late period. At Montmorillon, on the river Gartemps, the church of Notre-Dame, originally dependent on Saint-Savin, had a crypt hollowed out of the rock which was dedicated to St. Catherine. Here are frescoes, very well preserved, depicting the mystic betrothal of the saint - the Virgin holds the infant Jesus on her knees and crowns St. Catherine with her right hand. The holy women of Poitou surround the central group. In front of the transverse arch are two Elders of the Apocalypse. The general effect is extremely graceful, and makes its appeal through sensitive delicacy. Romanesque severity has been abandoned; we are already on the threshold of the Gothic world. At Loches, the royal town, the Collegiate church of Saint-Ours is more interesting for its architecture and the magnificent porch with polychrome Romanesque sculpture, than for its paintings, of which little is left. However, we can still see, in a tiny crypt, the well-preserved portrait of St. Brice, who succeeded St. Martin as bishop of Tours. This somewhat primitive painting, sober in colouring, dates from the second half of the eleventh century and is thus one of the earliest Romanesque frescoes in France. Further south, in the Indre, the choir of the church of Meobec is covered with frescoes in very good condition. We see here an angel with St. Joseph, an archer on a white horse, two angels and, among other saints, St. Martial and St. Peter on a throne with dragons. Despite the simplicity of its colours (yellow, red and white on a light background) and the charm of the drawing, the whole thing scarcely conveys an impression of grandeur. These late twelfth-century paintings lack homogeneity, having no single iconographical theme. In the upper Garonne, at Saint-Plancard, the church of Saint-Jean-Baptiste displays a number of peculiarities. First, from an architectural aspect: it is the only church in the south of France to have been designed with two apses opposite one another. The apse and apsidiole of the southern wing are covered with paintings. Situated on an old Roman road, later used by pilgrims going to Santiago de Compostella, the apse of this sanctuary is covered with very archaic paintings, crude in style - the Adoration of the Magi, Christ in Majesty, the Crucifixion and Ascension - in which the violence of movement and the splendour of the costumes bear a certain resemblance to those of the Coptic paintings of Baouit, which can be seen in the Coptic Museum at Cairo. The artist who created them, towards the middle of the twelfth century, may previously have visited the Holy Land and Egypt. The apsidiole was probably decorated by a different artist, for the composition showing Herod's head and shoulders next to those of the executioner who has just beheaded John the Baptist shows greater harmony and refinement. It dates apparently from the beginning of the twelfth century and is much closer to the work found in Catalan Roussillon than to French Romanesque paintings. The modest chapel of the priory of Berze-la-Ville, which St. Hugh, Abbot of Cluny from 1049 to 1109, built about ten miles from the great abbey, and where he used to come in search of privacy and rest, is adorned with frescoes in which the influence of Byzantine art - especially icon painting - is clearly visible. Is it because they are the work of an artist of the Cluniac tradition, trained at Monte Cassino, that the paintings of Berze-la-Ville have such strongly Byzantine characteristics, or, on the contrary, did the painter learn his art at the court of the Emperor Henry III? It is well known that St. Hugh maintained a close connection with the latter and with the Byzantine court. As no comparable work exists in France, one is inclined to classify the paintings of Berze-la-Ville with those of the convent of Nonnberg at Salzburg or with those of the Abbey of Prufening, which was also Cluniac. In any case, these frescoes were executed not by a modest craftsman but by a great artist using a large number of colours, rich and dense. Against dark blue backgrounds in which are mingled coppery tones, purplish red or madder, the white or orange ornaments on the figures' garments contrast with the red ochre of their hair and the green of some of the haloes. Around the mandorla of the Christ in Majesty in the half-dome of the apse, we see the twelve apostles, and at their feet four smaller saints. On the left is St. Paul, then on the right St. Peter receives from Christ's hand a roll, which some authorities have identified as the gift of the site on which Cluny was built to the apostles Peter and Paul. More probably it represents the handing over of the Law to the apostle, as a symbol of Cluny's submission to the Holy See. To the left and right of the windows are scenes of the martyrdom of St. Vincent and St. Blasius, also of very fine quality. Turning to the Auvergne, we find in the church of Lavaudieu an end wall covered with a huge Romanesque fresco in which Byzantine influence is still very strong, but in which the French character is already recognizable. The expressiveness of faces and hands, with shadows and intermediary tones, seems to anticipate Gothic art. 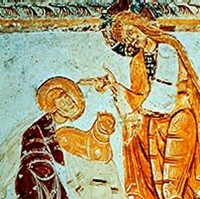 This painting, which shows Christ in Majesty giving his blessing with, below, the Virgin surrounded by the apostles, somewhat recalls that of the church of Montcherand in Switzerland and probably dates from the twelfth century. Saint-Julien-de-Brioude was an important stage on the road to Compostella, and pilgrims came here to pray at St. Julian's tomb. Thus it is not surprising that this fine church, the largest in the Auvergne, has retained a portion of the frescoes which formerly decorated a chapel in the gallery, dedicated to St. Michael, and also fragments of decoration on some of the nave pillars. Like those of the cathedral of Le Puy, the paintings of St. Michael's chapel are executed on a very dark background. But the subject on the north wall, Hell with its terrifying demons, is illustrated with a surrealistic fantasy as nightmarish as that of Hieronymus Bosch. We find here echoes of Asiatic works, and although we must remind ourselves that this is already a Gothic work, in its extravagant inspiration and in its workmanship it is still typically Romanesque. The other fragments reproduced, the mason - the artist has depicted, with astonishing freedom, two masons and, probably, the architect - as well as a head from one of the pillars supporting the gallery, and the fox eating a goat, display an inventive faculty which was quite unique at the time. French Romanesque art also includes illuminated manuscripts, including gospel texts and other types of illuminations: for more detailed information, see: Romanesque Illuminated Manuscripts. It also includes panel paintings as well as fresco murals, many of which can be seen in some of the oldest cathedrals and churches in France, as well as in the best art museums throughout the world.  For the meaning of medieval French murals and altarpieces, see: Famous Paintings Analyzed.  For more about pre-Gothic painting and sculpture in France, see: Homepage.